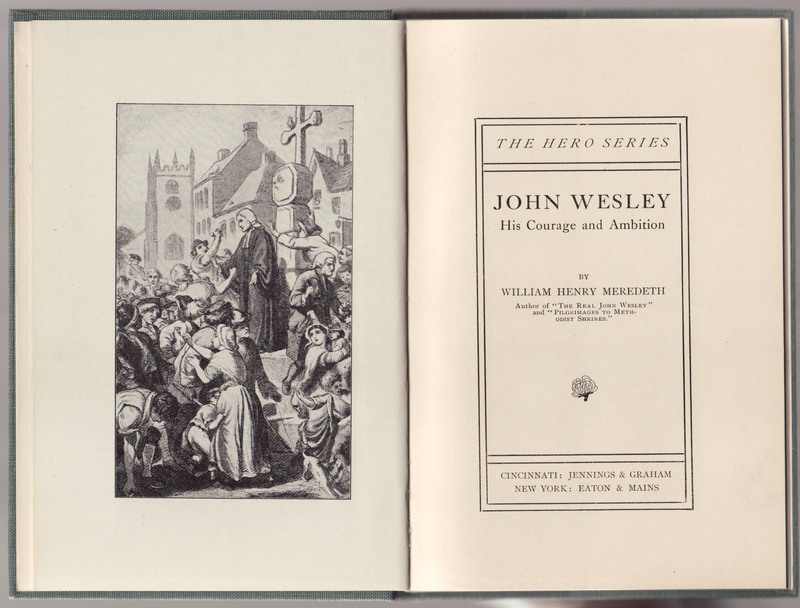 John Wesley was at one point called “the earliest devisor in England of cheap publications for the common people” (Publishers’ Weekly, 129, 29 February 1936, pp. 981-983). Early Methodist publishing produced books sold by itinerant preachers in Europe, and the book sales were a significant part of these preacher’s income. 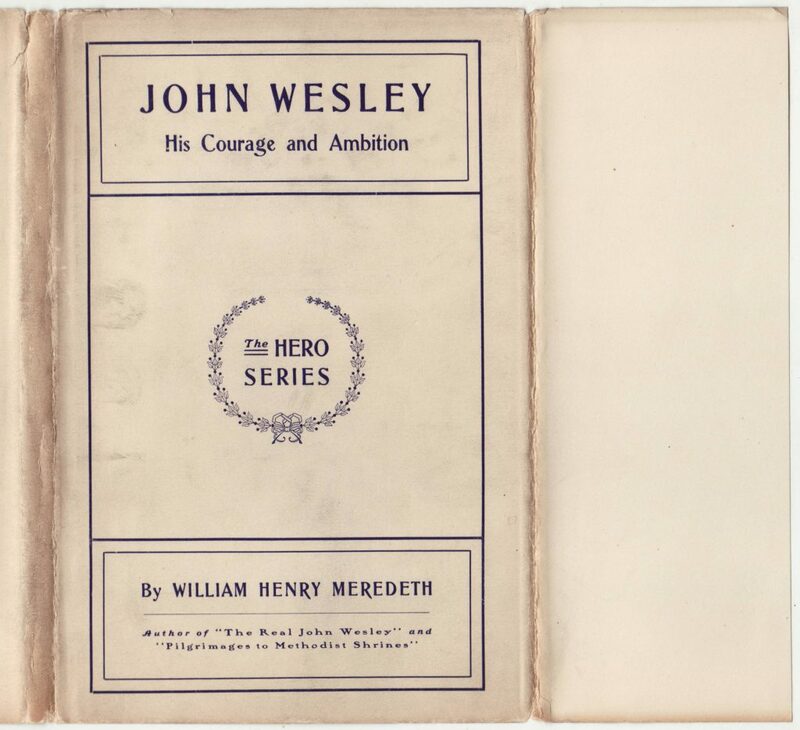 This publishing model was transferred to the Americas when the Methodist Book Company was established in 1789 in Philadelphia. The firm moved to New York in 1804. In 1819 the name of the firm was changed to Methodist Book Concern. In 1820 the Western Methodist Book Concern was established in Cincinnati. 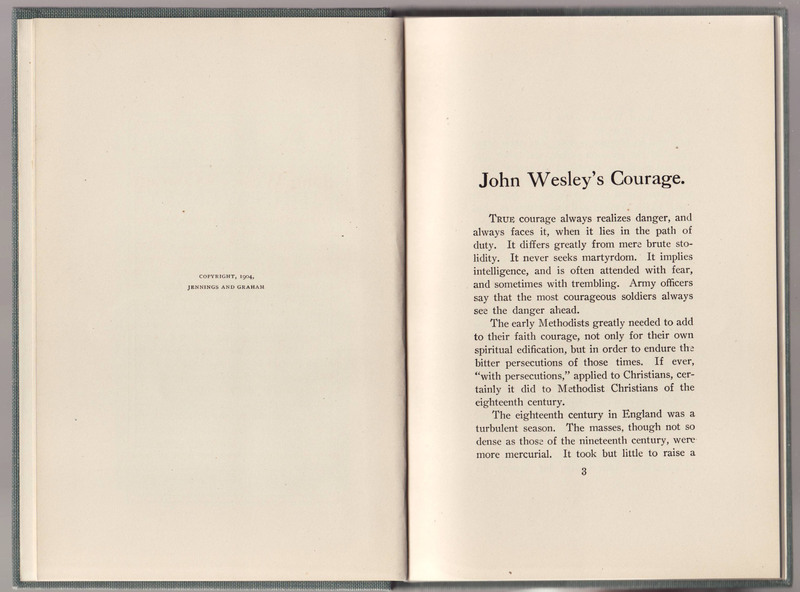 The imprints of Jennings & Graham and Eaton & Mains are affiliated publishers using the names of the managers of the Cincinnati and New York offices of the Methodist Book Concern. Titles under these imprints (which occur together in most cases) emerge in the 1880s and continue through 1913. In 1913 the Eastern and Western Methodist Book Concern firms (and subsidiaries) are combined under the name of the Abingdon Press. The Hero Series consisted of brief titles including text extracted from other longer works. 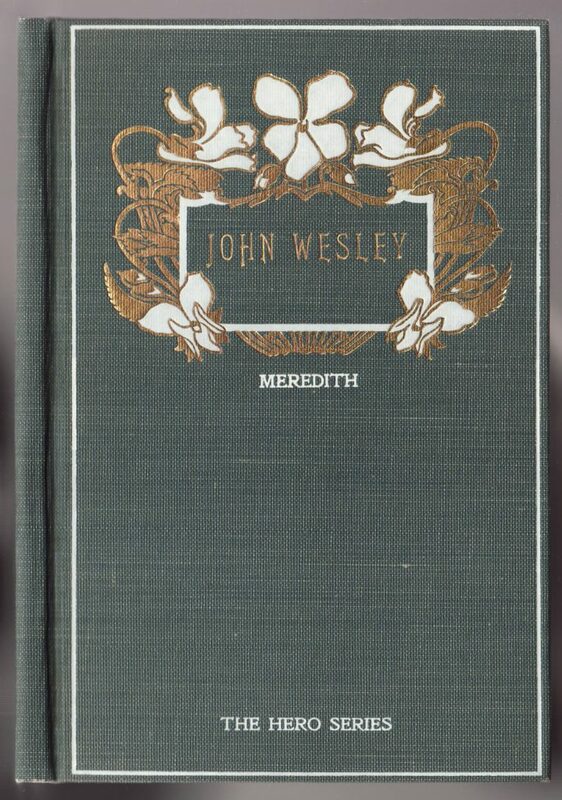 In the case of the John Wesley title below, the two essays in the volume are drawn from a longer work (The Real John Wesley) by the author. 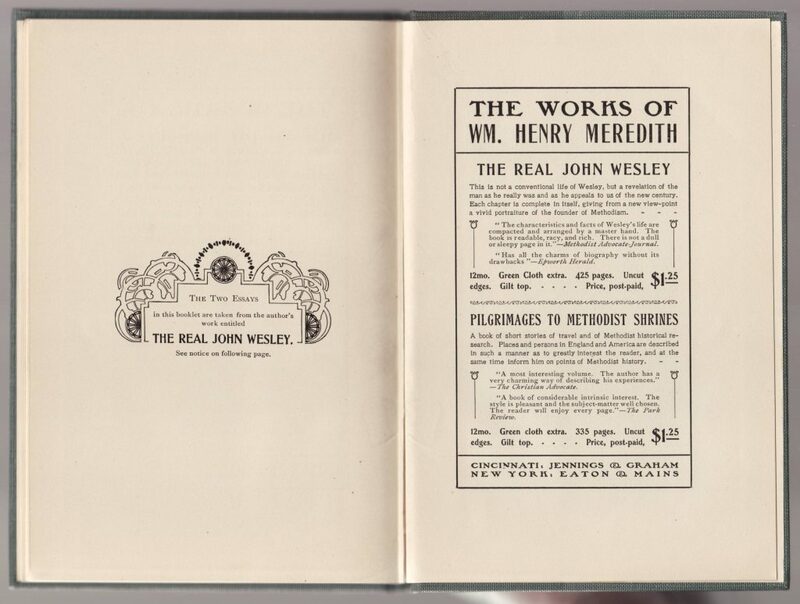 The books cost .25 cents, certainly less than the cost of the longer texts they were drawn from (The Real John Wesley was $1.25). The series may have been seen as a means for a cheaper entrance into Methodist literature, in line with the tradition of cheap books for the people. Jackets are common to the series, with a simple series colophon at the center of the front of the jacket. There is no printing on the jacket spine, nor on the front or rear jacket flaps. This edition of John Wesley: His Courage and Ambition by William Meredeth is copyrighted in 1904. It may have been reprinted after that year (so the book can only be dated to the 1904-1915 timeframe). The series is not advertised after 1905, however. 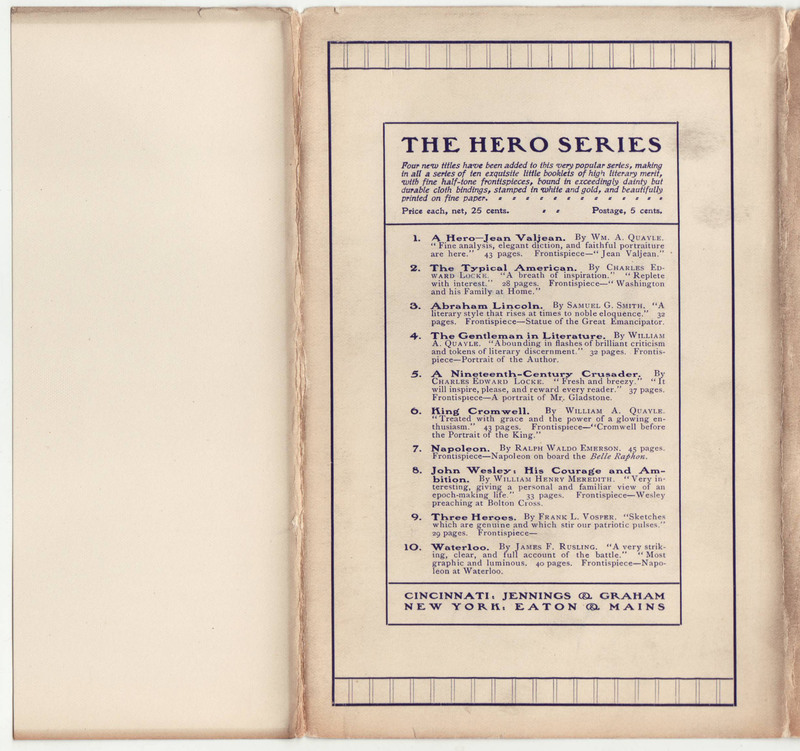 The rear of the jacket lists 10 titles, all .25 cents each. This seems to be all of the titles in the series. The books are pleasantly bound in green cloth with illustrated covers printed in gold and white. The series name is included on the book cover. There is no printing on the book spine. The one illustration in the book faces the title page. The series name is included on the title page. 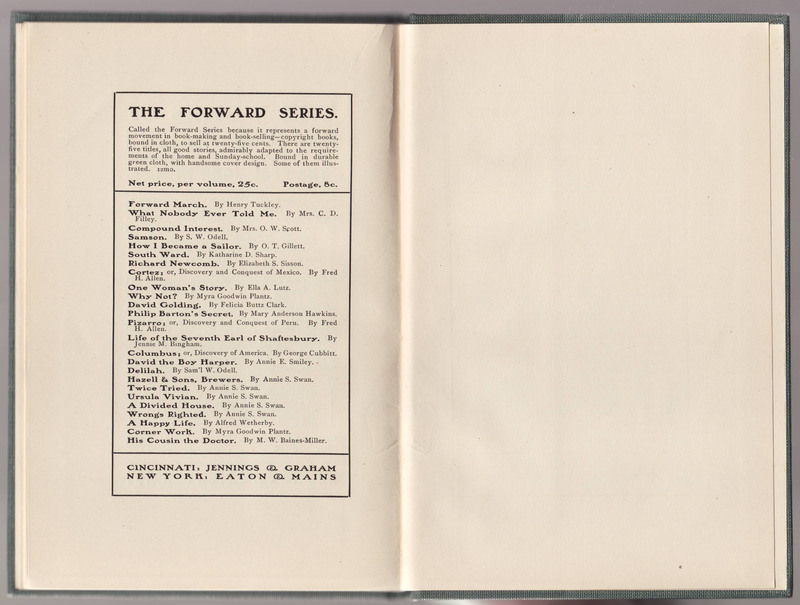 The copyright page includes the date 1904, which is near the end of the series availability. The source of the two essays in the book is indicated near the end of the book, along with an advertisement for the original title, and another book by the same author. An advertisement for a related series, the Forward Series, follows, with 24 titles. This series seems to be short, copyright fiction.